LOCAL photographer and surfer Robin Mather was a couple of minutes away from paddling off Lennox Point for a surf in the epic winter conditions with his mates when all hell broke loose yesterday morning. "We had our wetsuits on, just walking down the track ... then all these guys started running towards us saying 'there's another shark attack'," Mr Mather said. As the surfers walked down to the shore, they saw surfer Michael Hoile paddling in over the rocks, surrounded by a big crowd. "Everyone was gathered around him," Mr Mather said. "The back of his board where the fins are had all these puncture marks, and one of the fins was knocked out. "He looked fully shaken up." A mate of Mr Mather's was actually riding a wave during the incident and said there was a lot of white water around Michael Hoile during the attack. "He thought the guy was in a fight; that he was wrestling the shark. "It was really lucky he didn't have his feet bitten off. He fully dodged a bullet and got away with it." Harley Kingston was watching the surf from Pat Morton Hill when the attack occurred. "He was just cruising along and all of a sudden this big, black bus looking thing comes out of nowhere and makes a huge splash and attacks the back of his board," he said. "His board goes flying vertically like a tombstone, you don't see where he goes and all of a sudden there's this huge splash like a car had dropped in the water it was that big." Lennox Head shark attack: Witness Chris Brock and surfer Paul Weston discuss the incident at Lennox Head this morning. 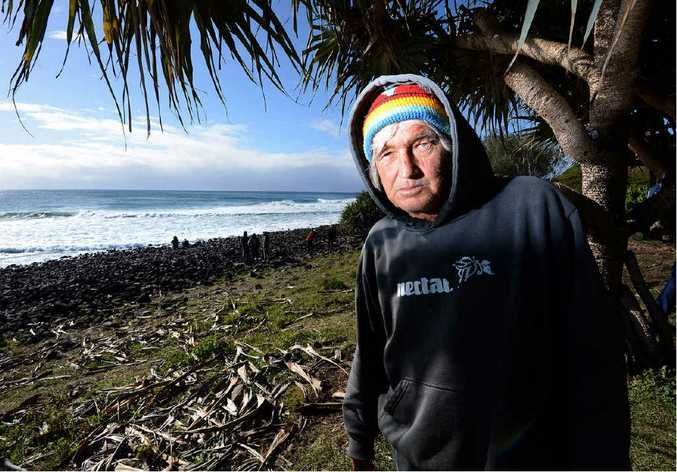 Long-time Lennox Head surfer Chris Brock was watching the surf on the walk up to Pat Morton Lookout when he saw a "huge surge of white-water" on the wall of the wave. Trent Collins saw someone get knocked off his surfboard with a "massive splash" next to him. After seeing the teeth marks on the board, he thought the shark "was maybe two to three metres". Are plastic planes the future of flight? Oz Grom competitors "most protected surfers in Australia"